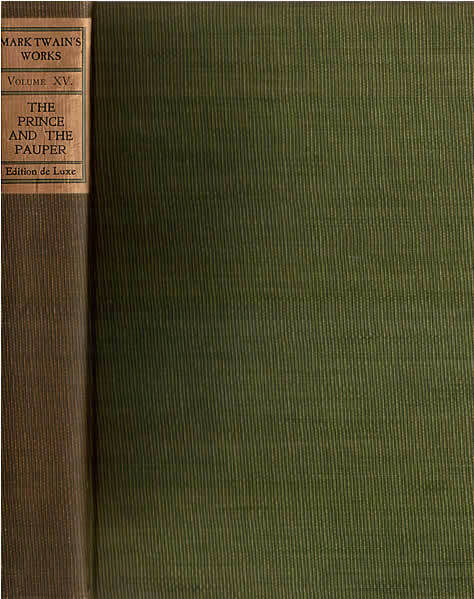 The American Publishing Company's Edition De Luxe and Japan Editions were an unsigned format of the 1899 Autograph Edition. The Edition De Luxe was available in both cloth and leather bindings and every volume hand numbered. In a letter from Clemens to Frank Bliss on 31 March 1899 Clemens wrote, "I want set No 1 of the de luxe edition to go to Mr. Rogers, and to be charged to me (minus agent's commission)" (Leary, p. 294). 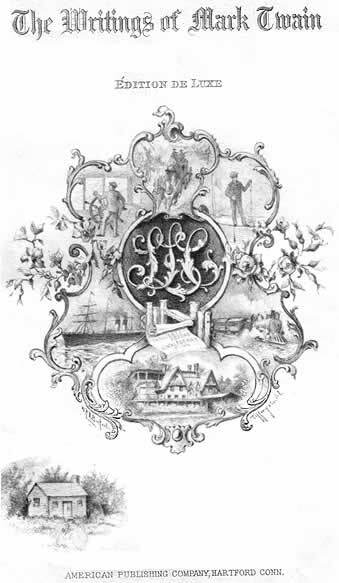 If Henry Rogers received set number 1 of the Edition De Luxe, it has not yet been located. Edition De Luxe limitation statement with the MARK TWAIN watermark. This statement appeared in every volume of the back of the flyleaf. It was Clemens's intent that Henry Rogers have set No. 1. The present location of Rogers's set is unknown. Japan Edition limitation statement appears in every volume on the back of the flyleaf. 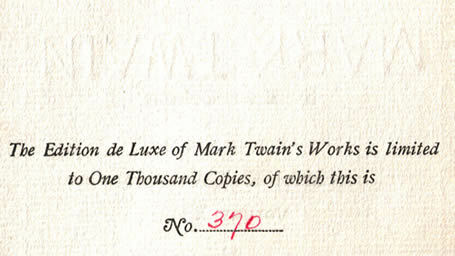 Special paper with the MARK TWAIN watermark is a unique and distinguishing characteristic of the first 23 volumes of the Edition De Luxe and Japan Editions. The subscription price for the Edition De Luxe and the Japan Edition was $110 -- the equivalent of about $2700 in the year 2007. Both editions were affordable to only the upper income tiers of American society. 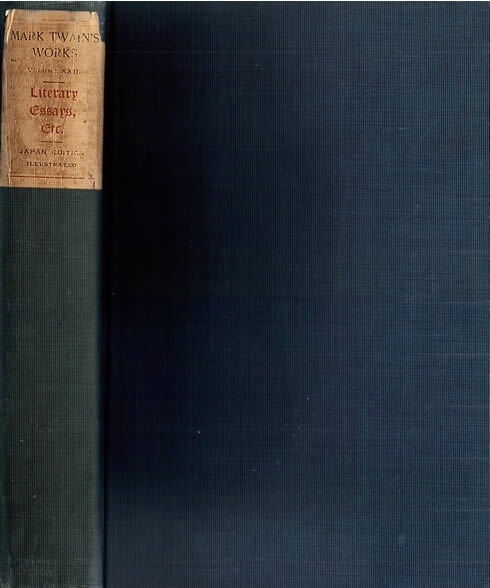 In 1903 American Publishing Company added Volume 23 to the set. The following advertisement appeared in the New York Daily Tribune, February 2, 1905 when the editions were being featured at clearance prices of $39.50 via direct newspaper marketing and not door-to-door subscription sales. Ad from New York Daily Tribune, February 2, 1905, p. 13. Evidence indicates that neither the Edition De Luxe or the Japan Edition alone approached 1,000 sets and that the combined numbers of both editions was 1,000.